As a child, I used to hate healthy leafy greens, or any vegetables for that matter! 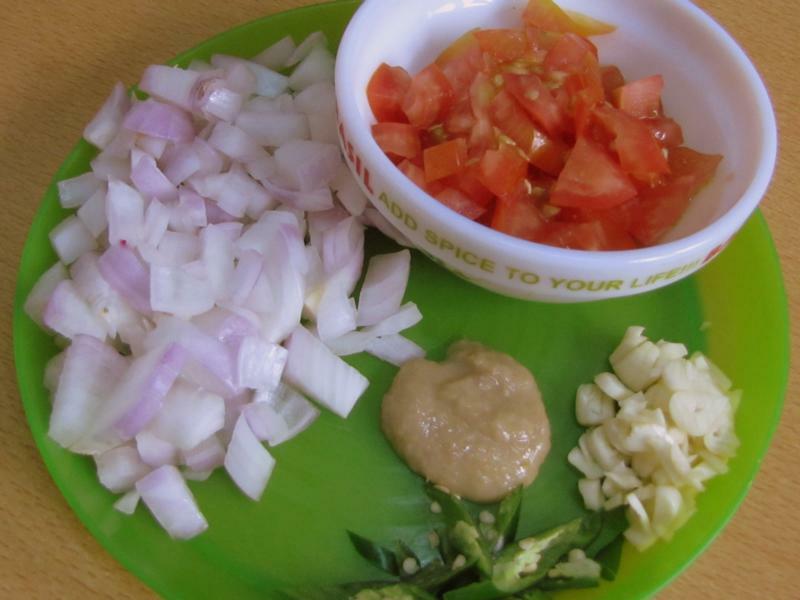 As far as I know, most kids don’t like vegetables like Methi/Fenugreek or Palak/ Spinach. Most mothers try to convince, cajole and even force-feed their children to eat these greens leading to tantrums, quarrels and in some cases even spanking, I suppose. However much you hate these vegetables as a child, very often, you grow up to absolutely love them… perhaps it is to do with your developing taste buds… or maybe you do grow older and wiser, realizing the many benefits of adding some greens to your diet. Fenugreek is such a versatile food. 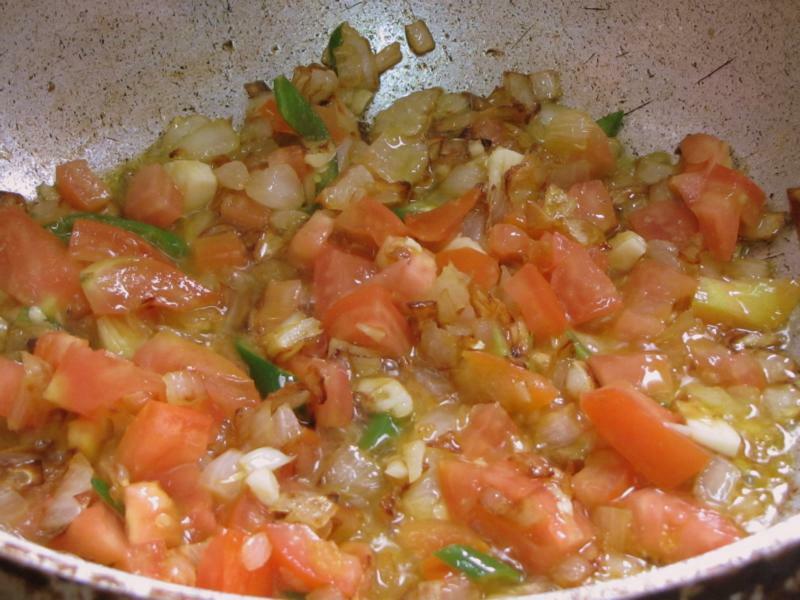 You can use it on its own in a vegetarian preparation, in dals, with meats, and with poultry. Methi seeds are used in tempering and dried Methi leaves (Kasuri Methi) is used to add a distinct flavor to some dishes such as Butter Chicken. Once you develop a taste for it, you can’t have enough of it… besides it has a long list of health benefits including, reducing cholesterol, controlling diabetes, aiding in digestion and increasing breast milk production in nursing mothers. This is a simple Aloo Methi recipe that I make often when fresh Fenugreek is available in plenty. 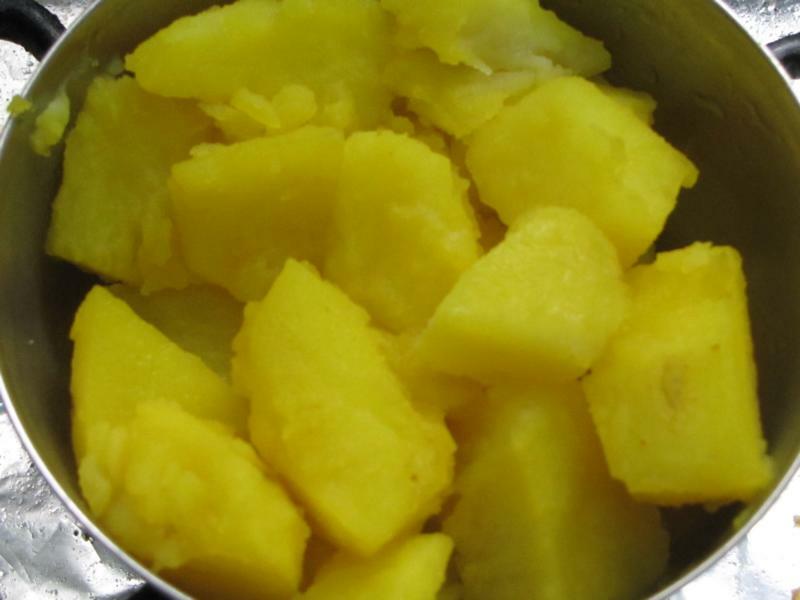 Potatoes not only add to the flavor, but also aid in enhancing absorption of iron present in the Methi. Add the spice powders – turmeric, chili and coriander. Fry till the oil starts to separate. 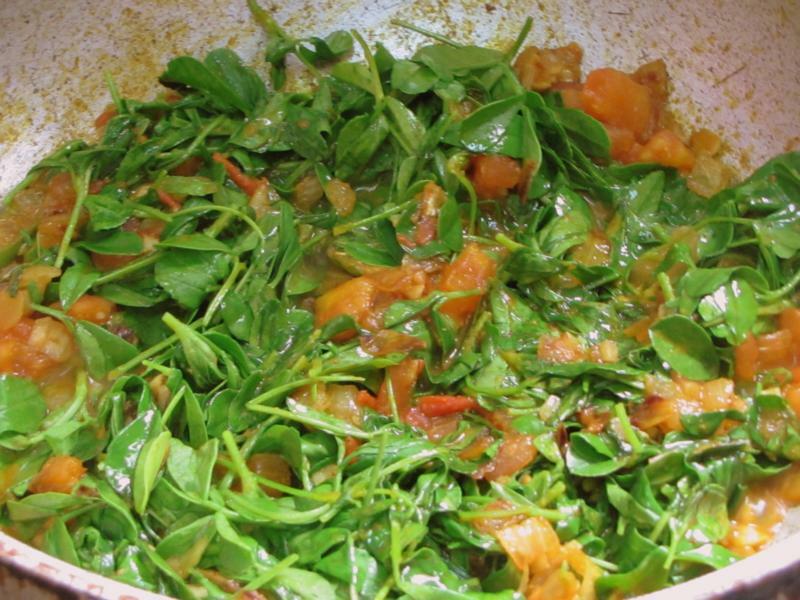 Pick the Methi leaves and clean very well by rinsing thoroughly. There is no need to chop. Add the leaves to the spice mix. Add salt and mix well. 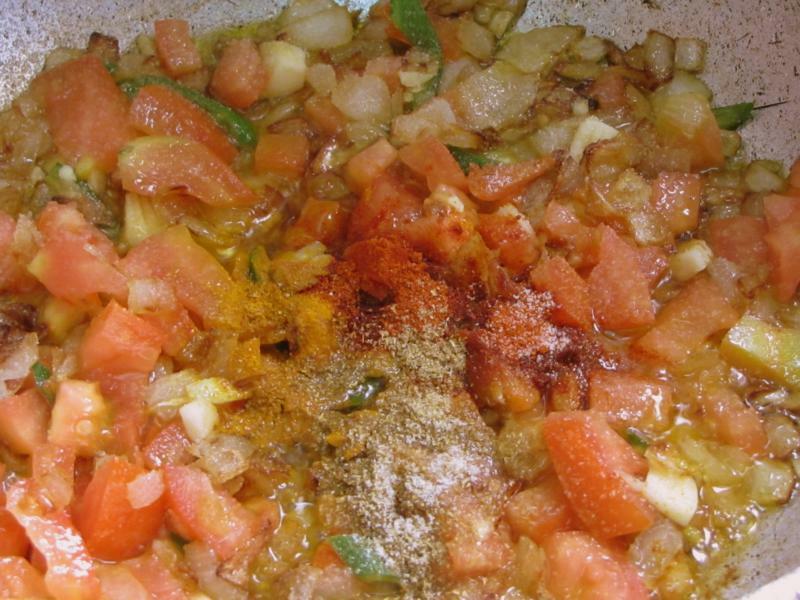 Cook on medium flame in an open pan. Leafy vegetables have high water content, so there is no need to add water while cooking. 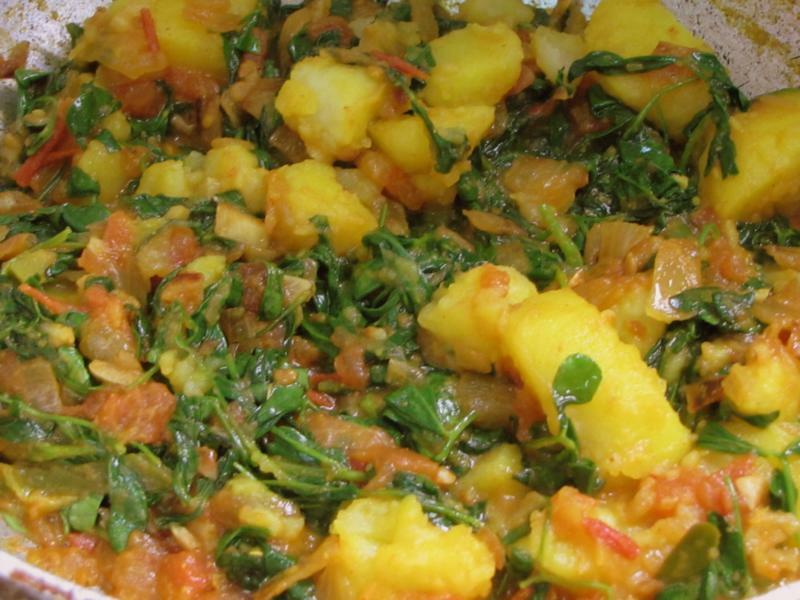 When some of the water let out by the Methi has evaporated and it is semi-dry, add the boiled and cubed potatoes and mix gently. In a pan heat some oil. Add onions and fry till translucent. Add the garlic. Fry for a minute followed by ginger-garlic paste and green chilies. Fry for two minutes. Add the tomato, turmeric powder, chili powder and coriander powder. Fry till the oil separates. Add the Methi leaves and salt and mix well. Cook on medium flame till semi-dry in open pan. Add the boiled potatoes and mix gently.